In the 1700s, Europeans settled this area known as Indian Camp and developed a plantation economy along the Mississippi River. Robert Camp, a planter from Virginia, began purchasing land here in the 1820s. He farmed sugarcane and owned about 100 enslaved workers. Camp called his plantation “Woodlawn,” but the older name for the area, Indian Camp, stuck. The 30 room mansion behind you, to your right, was built in 1859. The architect, Henry Howard, also designed Nottoway Plantation, which is located across the river. In 1892, Louisiana passed a law calling for the quarantine of persons diagnosed with leprosy. 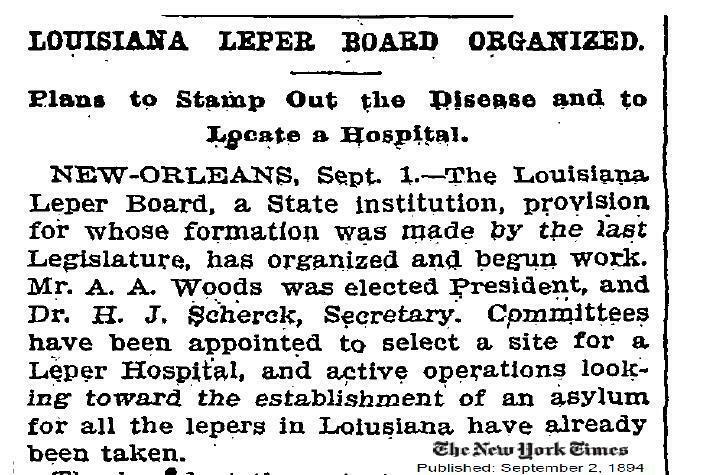 The Louisiana State Legislature, with Dr. Isadore Dyer, a dermatologist from Tulane College of Medicine, established the Board of Control to create the Louisiana Leper Home. The Board rented Indian Camp Plantation, which by then had been abandoned. The first 7 patients arrived from New Orleans by coal barge in 1894. A diagnosis of leprosy made use of public transportation illegal. The first patients lived in the slave quarters because the plantation was in ruin. A doctor made weekly visits, but the patients mostly fended for themselves. In 1896, the patient population was about 35. Lay nurses would not serve here because of fear, so the State signed a contract with the Daughters of Charity of St. Vincent de Paul (DOC), an order of Catholic nuns whose mission is to care for the sick and the poor. The first 4 DOC arrived in 1896 to provide "the nursing of the patients and the household management" for $100 each per year. 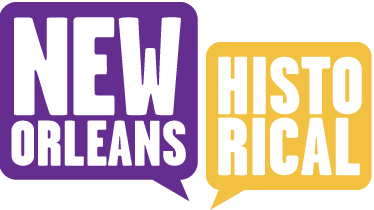 (To learn more about the involvement of the Daughters of Charity with leprosy patients from New Orleans to Carville, visit this site.) By 1900, the patient census was about 100. To your right, one sees the 2-story building with rectangular chimney; this was the quarters built for the Sisters. There were about 25 individual rooms, a common dining hall, and a private chapel. The DOC remained on site until 2005. 116 sisters served the Carville mission as nurses, dieticians, laboratory researchers, pharmacists, teachers and spiritual leaders. The miniature “house” behind the plantation was built around 1920. Its uses varied from arts and crafts house; greenhouse; and catechism classroom. 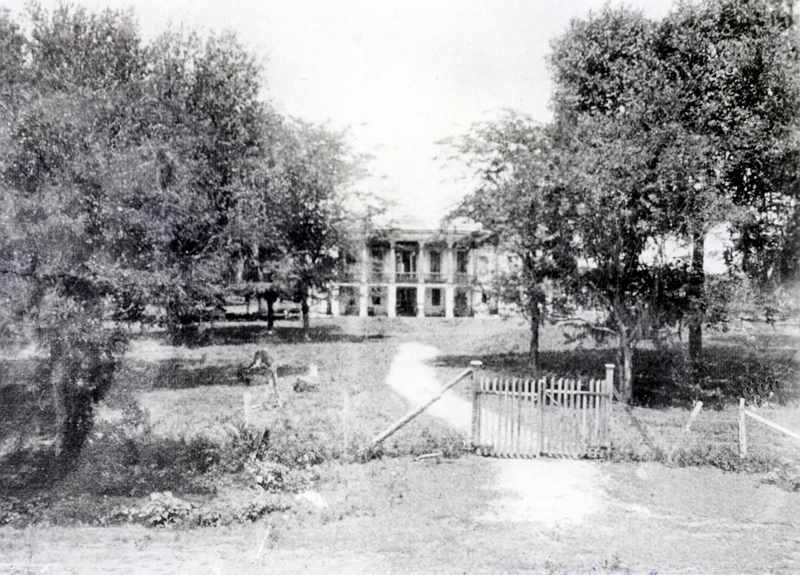 The plantation home itself was eventually refurbished and served as the administration building for the hospital. For the next story site, please drive about 200 feet forward near the US Postal box on the right. 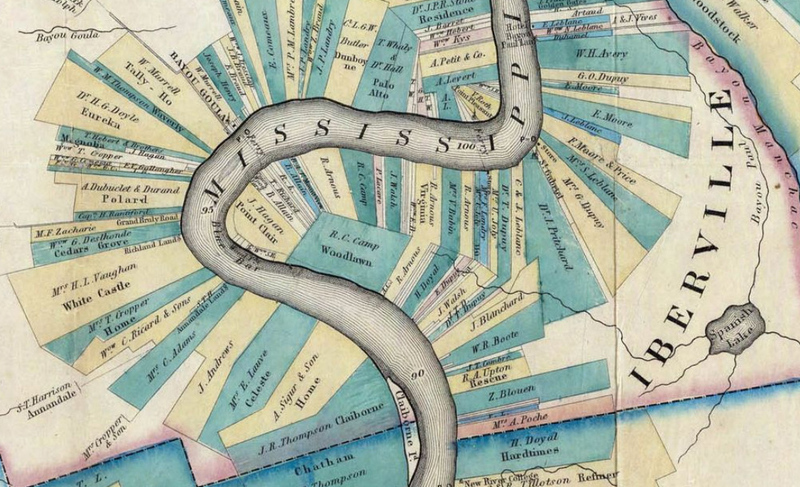 Persac's Map of the Mississippi, 1858. : This detail of Persac's map of the Mississippi shows the 400 acre estate "Woodlawn" and lists R. C. Camp as the landowner. Though Robert Camp officially named his plantation "Woodlawn" and it is listed as such on some maps, the property was always referred to as "Indian Camp" by locals because historically it had been the hunting grounds of the Houmas Indians. The name Indian Camp also was an interesting word-play on the owner's name. Entrance to Indian Camp Plantation, 1890's. Image Courtesy of the National Hansen's Disease Museum, Permanent Collection. Carville, LA. : Indian Camp Plantation had several acres between its entrance and the Mississippi River when it was originally constructed in 1857-59. After the Great Flood of 1927, the Mississippi levee was reconstructed to a much greater height and reconfigured the landscape up and down the river, essentially removing acres of frontage from the old estates. Indian Camp was no exception. Carville History Materials Gathered by Sr. Hilary Ross, DC. Detail, Dr. Isadore Dyer and Sr. Beatrice Hart. Image Courtesy of the National Hansen's Disease Museum, Permanent Collection. Carville, LA. : Sr. Hilary Ross, DC, was not only a brilliant and widely published researcher on leprosy who ran the laboratory at the leprosarium in Carville, but she also functioned informally as Carville's historian. 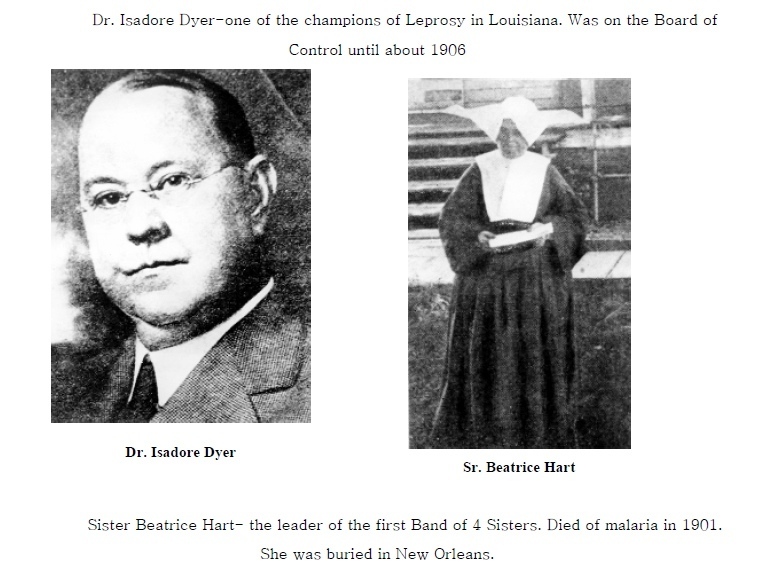 Dr. Isadore Dyer and Sr. Beatrice Hart were two early founders of the Louisiana Leper Home, in a rural community located on the East bank of the Mississippi River that became known as Carville. Indian Camp Plantation, 1894 Image Courtesy of the National Hansen's Disease Museum, Permanent Collection. Carville, LA. : When the first patients arrived in 1894, Indian Camp Plantation was falling apart and uninhabitable. In 1896, when the first Daughters of Charity arrived to begin their mission of nursing patients, a slow renovation process of the manor began. When the federal government took over the buildings and grounds in 1921, Indian Camp was renovated and became the permanent administrative offices for the US Public Health Service. Today, Indian Camp is the administrative HQ for the Louisiana Military Department. Arrival of the First Seven Leprosy Patients in 1894. 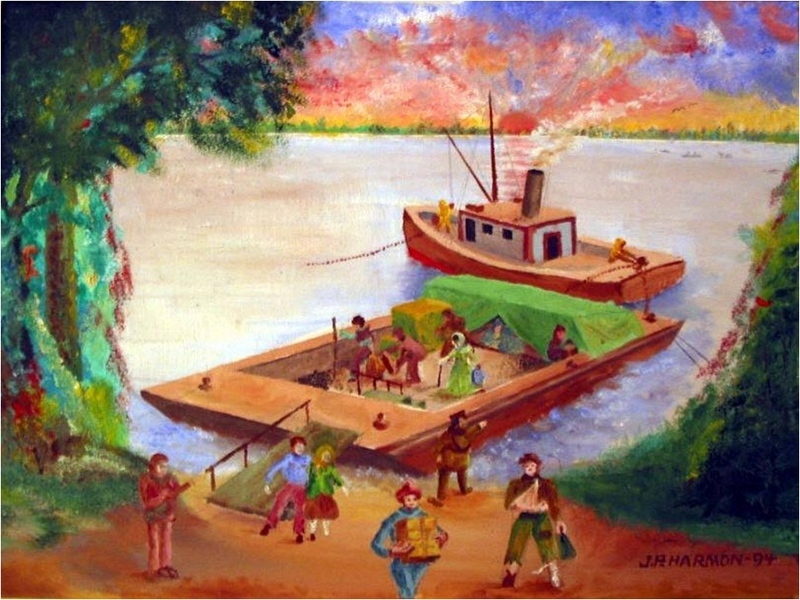 Johnny P. Harmon, oil on canvas, 1994. Image Courtesy of the National Hansen's Disease Museum, Permanent Collection. Carville, LA. : Because of the laws prohibiting using public transportation for an officially quarantined disease like leprosy, the first seven patient who arrived at Indian Camp Plantation in November of 1894 had to be moved via coal barge. They arrived with furnishings, supplies and food donated by Charity Hospital in New Orleans. 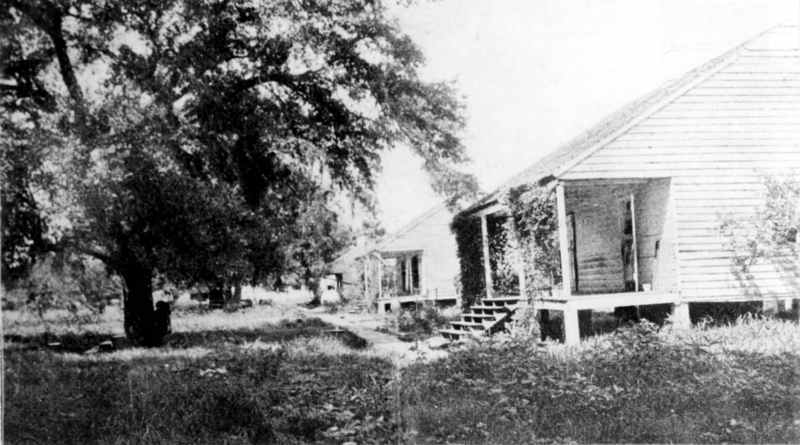 Slave Quarters on Indian Camp Plantation. 1894, photograph. Image Courtesy of the National Hansen's Disease Museum, Permanent Collection. Carville, LA. : The few slave quarters still standing at Indian Camp Plantation in 1894 were in better repair than the plantation manor itself when the first patients arrived. 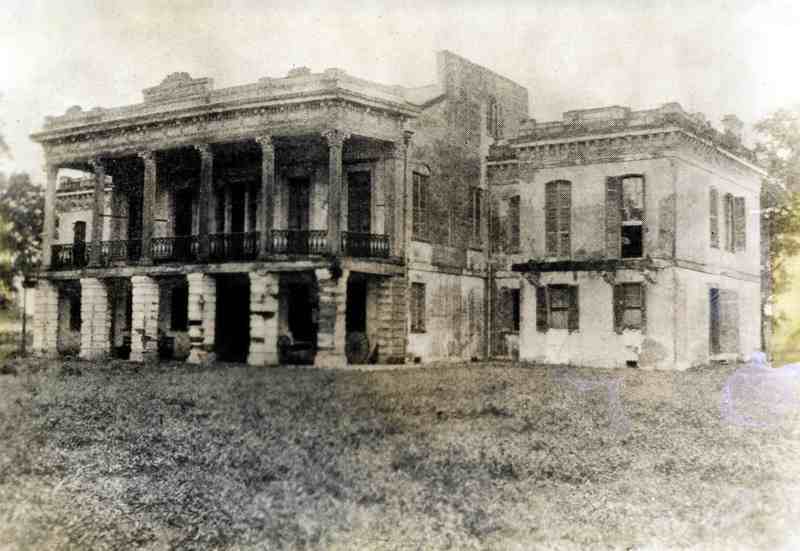 The first seven leprosy patients quarantined to the property took up residence in the quarters with the clothing and bedding donated by Charity Hospital in New Orleans. 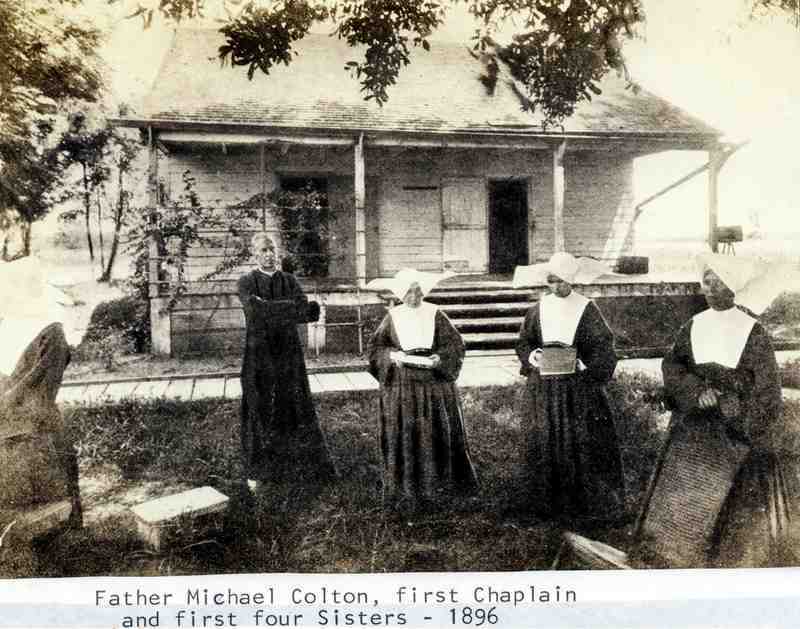 The Daughters of Charity of St. Vincent de Paul Arrive at the Louisiana Leper Home, 1896. Image Courtesy of the National Hansen's Disease Museum, Permanent Collection. Carville, LA. : The first group of four Daughters of Charity of St. Vincent de Paul who arrived on April 27, 1896 were: Sister Beatrice Hart, Sister Superior Sister Mary Thomas Stokum Sister Annie Costello and Sister Cyril Coupe They were met with almost insurmountable obstacles, one being the dilapidated condition of the Indian Camp Plantation Home which was to be their quarters. Bats, snakes, rats and other pests had claimed it as their home and were not readily going to give it up. With Spartan spirits, the Sisters of Charity attacked the filthy house and soon had two rooms clean enough to be lived in. Over their 116 year mission to Carville, 109 Sisters served here in various medical capacities. 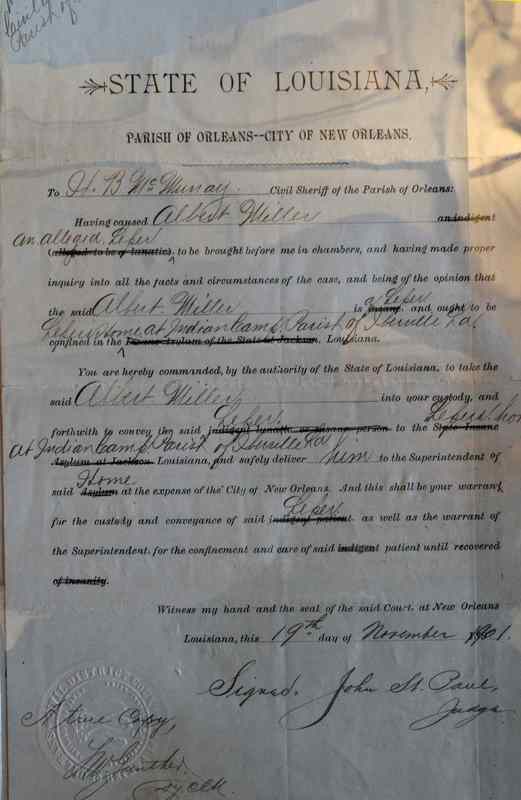 Bench Warrant to the Civil Sheriff of the Parish of Orleans to take patient to LA Leper Home, November 19, 1901. Document Courtesy of the LSU Hill Memorial "Louisiana Leper Home" collection. : Leprosy was quarantined by Louisiana law until the late 1950's. Note that the legal form has been altered to read "an alleged Leper" instead of "indigent" or "lunatic". 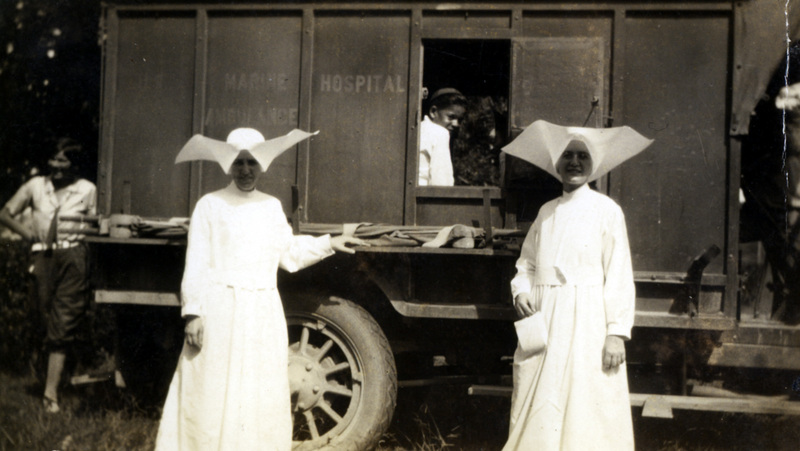 Daughters of Charity and Patient, US Marine Hospital #66, National Leprosarium ambulance, c. 1921. Image Courtesy of the National Hansen's Disease Museum, Permanent Collections. Carville, LA. : State health codes dictated the rules surrounding the conveyance of a person diagnosed with a quarantine-able disease like leprosy. Leprosy patients were denied the use of public transportation. Only designated vehicles would be used to transport patients to the Louisiana Leper Home (1894-1920) which became the National Leprosarium (1921-1999). 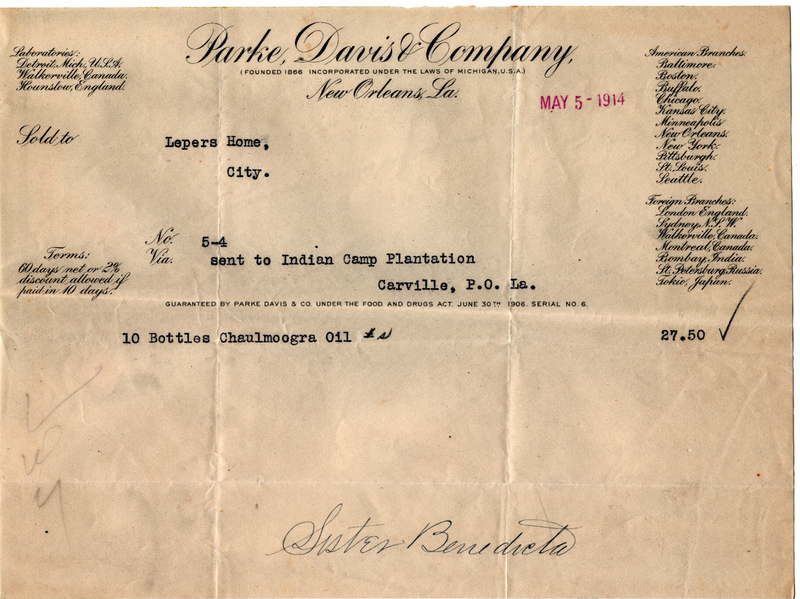 1914 receipt from Parke, Davis & Company for Chaulmoogra Oil purchased for leprosy treatment at Carville Courtesy of the Daughters of Charity of St. Vincent de Paul Archives, Emmitsburg, MD. : Before the breakthrough sulfone drug was developed at the leprosarium in the 1940's, chaulmoogra oil, ingested or injected, was the treatment of choice. The oil, pressed out of the seeds of the Hydnocarpus tree, is viscous and foul smelling by all accounts. The curative qualities of the painful and nauseating chaulmoogra oil treatment was never successfully proven scientifically, but its use did not cease until after the 1940's. "Hope House," patient dormitory at the Louisiana Leper Home, 1906. Image Courtesy of the National Hansen's Disease Museum, Permanent Collections. Carville, LA. : After 10 years of renting, the state of Louisiana purchased the Indian Camp Plantation property in 1905 and began building permanent structures. Public protest surged at every attempt the state made to relocate the Leper Home. Rebuilding the Leper Home closer to New Orleans was always the intent; that's where all of the medical experts and supplies were. Physicians from Tulane University's Department of Tropical Medicine were involved in lending their expertise, but a physician only traveled by river boat from New Orleans to care for the patients one day per week. 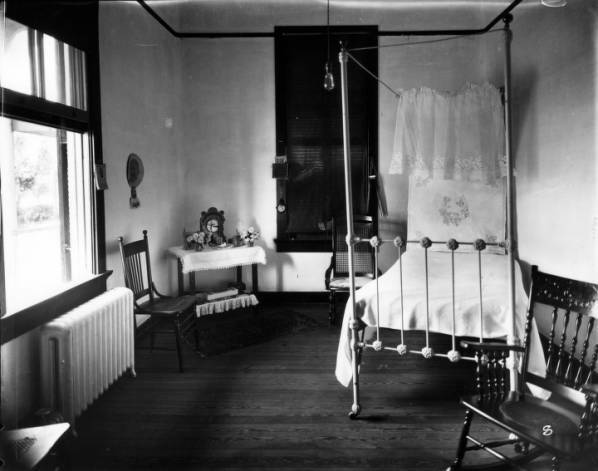 Interior furnishings of a Patient's Room, Louisiana Leper Home, c. 1916. Image Courtesy of the National Hansen's Disease Museum, Permanent Collections. Carville, LA. : Furnishings, bedding, and even clothes were provided to patients. Many of the materials were donated by other organizations, as well as individuals. Notice the radiator--steam heat from the electric plant was used to heat buildings hospital wide. A hospital report dated 1916 reported the installation of electric lights, the addition of the first cold storage plant and plans to bring movies to the patients. The first autopsy was also reportedly done. Dormitory built for the Daughters of Charity at the National Leprosarium, US Marine Hospital, Carville, LA , in 1940. Image Courtesy of the National Hansen's Disease Museum, Permanent Collections. Carville, LA. : The Catholic order of nuns, the Daughters of Charity, served as nurses, pharmacists, laboratory researchers, librarians, teachers, spiritual leaders and confidants over their mission at the hospital in Carville from 1896-2005. 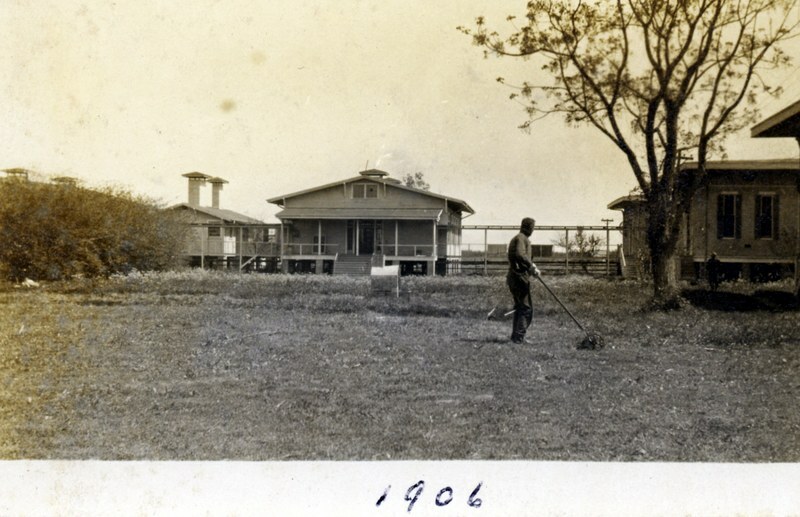 From 1896 to 1940, the Sisters lived in Indian Camp Plantation house, which doubled as the hospital's administration building under the state and federal operation of the leprosarium. 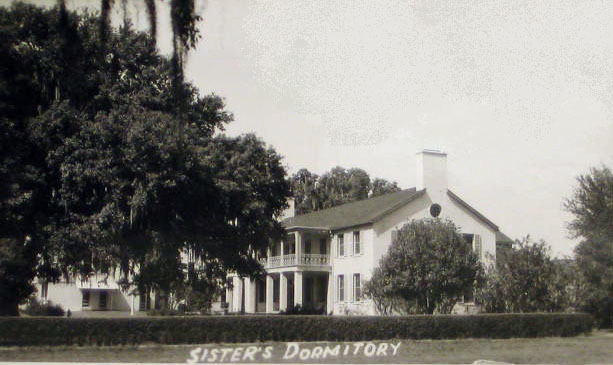 In 1941, construction on the Sisters Dormitories was completed. Each of the 21 Sisters had their own simple cell, outfited with a metal bed and small writing desk. The Sisters shared meals in the 1st floor dining room, prayed in a private chapel on the 2nd floor and collected Carville history in their archives. Today, the National Hansen's Disease Museum has copies of the documents, photographs and histories compiled by the Sisters' on mission to Carville from 1894-2005. Small house built by the State of Louisiana for the Daughters of Charity at the LA Leper Home. Image Courtesy of the National Hansen's Disease Museum, Permanent Collections. Carville, LA. 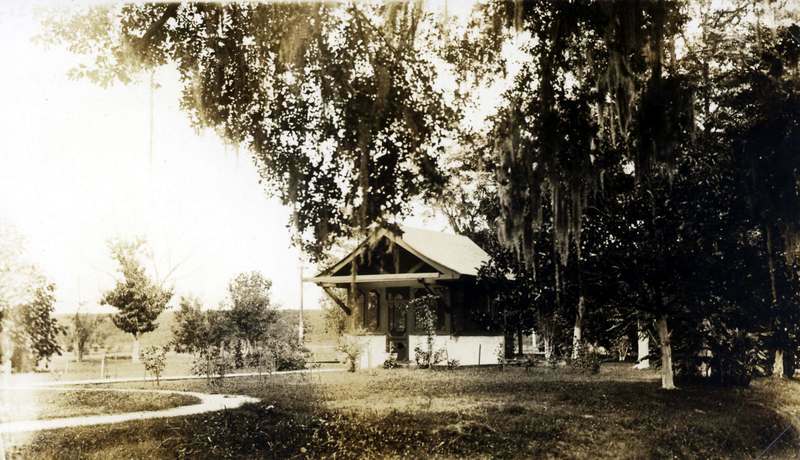 : This small 12' x 12' structure was built directly behind Indian Camp Plantation sometime after 1906. Over the years it has functioned as an arts and crafts house, a greenhouse, and later a catechism classroom for staff children of federal employees of the National Leprosarium. Today it is the Welcome Center for the Carville Historic District. Elizabeth Schexnyder, Curator of the National Hansen's Disease Programs Museum, created this tour for visitors to the Carville facility. tele: 225-642-1950, “Indian Camp Plantation / Louisiana Leper Home,” New Orleans Historical, accessed April 24, 2019, https://neworleanshistorical.org/items/show/621.